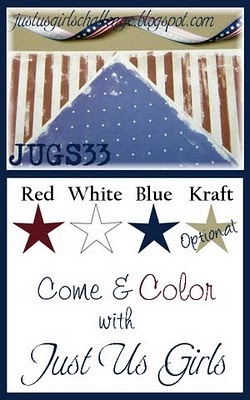 I had to play along with this weeks JUGS challenge, Red, White, Blue & Kraft. 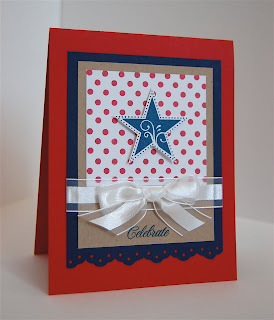 PTI's Star Prints works perfectly on patriotic cards & layouts! I tend to pull this set out often during this time of year...Memorial Day, 4th of July, Labor Day...just a stars & stripes kind of season! I may have to make another before I put all of my supplies away. Just too much fun :) I'm feeling like today is going to be a good day. The sun is FINALLY shining and we may actually get some Spring weather, YAY! I hope the sun is shining wherever you are too!! This is gorgeous! I love the simplicity and that single star. The ribbon is so elegant! Thanks for playing our JUGs challenge! I love your take on this card. It has your own flair to it.